GNB’s Voter Moe is a real-time polling app that enables users to express their opinions and explore the real-time responses of other users. Last nig ht, after the first presidential debate, the Denver ABC affiliate ran a story on RPL client Grid News Bureau (GNB), creators of the Gridiron Moe and Voter Moe apps. Gridiron Moe is a fast paced engaging game for fans watching football, who can now call offensive and defensive plays in real time and in sync with a live game on every down and see how others are calling the play. Voter Moe is a snapshot of how America is feeling about its candidates at any moment. It is a real-time sentiment crowdsourcing alternative to polling with real world numbers and demographics that enables voters to express their opinions and explore real-time demographics. Users communicate their opinions through the platform, for example whether they approve, disapprove, or are undecided about any Candidate. Users can also express opinions on each of ten core issues such as the economy, the environment, education and others. Users then get to see the real-time, aggregated, anonymized data from across the country. Users can then see what percentage of people from each party approve, disapprove, or are undecided, and explore the interesting core demographic details. No user-identifiable data that is provided is ever shared with anyone, the app is entirely anonymized. 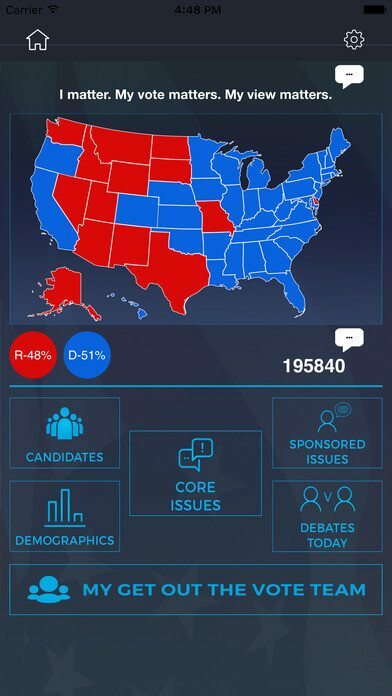 You can see the story here: Colorado developer creates real-time polling app.